The trip starts off at Puduraya Bus Station on the 25th of August 2004. The OGKL members, friends and families were waiting near Puduraya police station since 9 pm. They were Deeno, Fakhrul Anuar, Bullet, Yap, Kak Zaleha, Yassir, Abdul Hisham, Hadzrey, Idzam, Bob, Azlen, Jusrizaldi, Salina, Ahmad Rafaei, Mohd. Faizal, and Mohd. Faizul. 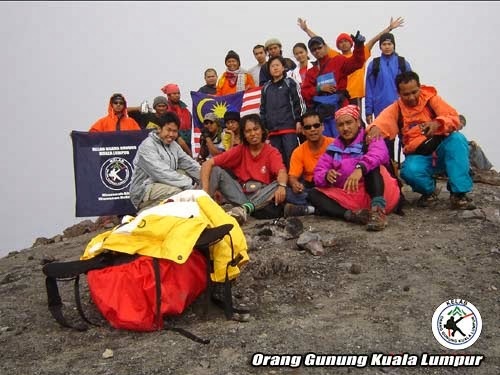 Group pictures were taken with club flag celebrating the beginning of Merdeka Expedition. The bus took off at 10 pm sharp where we bid family and friends the final farewell. We took the Transnasional bus which costs us RM8. It was a nice 2 hour plus bus ride. Everyone was eager for the trip and nobody dares to sleep, yet. I think it's due to the 'I won't miss a thing' sensation, but yet, everyone was enjoying the bus ride to Malacca. We reached Melaka Central at 11.55pm and Hotel Mansoor at 12.15 am. At the Hotel Mansoor front, we were greeted by one of the hotel staff. We were then directed to a corner of reception area where we rest our backpack. Boon Lee (Miss Tan), Mohd. Nor, Amrin, and Muhd. Suhaimi were found sipping teh tarik outside the hotel. The latter were from Singapore while the former three arrived from Johor and Melaka. We had a late supper and combined and distribute our rations and tents in the dormitory. Everyone went to bed around 2:30 am and snores at 2:31 am. We woke up at 6:30am. While waiting for our turns for shower, some of us made the final look through and arrangements of backpacks. The Committee Members made sure that the weight is distributed evenly to each backpack. It's quite a heavy load to pack but then, it's a pretty long trip. All of us were ready and started walking to Malacca jetty at about 7:30 am. It's only 10 minutes walk from the hotel. Deeno collected all passports and were handed to the Ferry Malaysia Express booth. Those were individual international passports as well as group passports. The fare for one person return Malacca - Dumai is RM150.00. Money changers were also located close to the booth. We had our breakfast and it was the last Malaysian meal of the expedition. The President gaves a speech and Yassir read out some do'a. Among other things, Deeno expressed that our objective to Sumatra is not only to climb mountain or shopping, but to see and learn first-hand while perhaps experience the lifestyles of the inhabitants. He also warned us not to entertain any of those porters or beggars in Dumai jetty. We then entered the Malaysian immigration building and through to the transfer boat. The smaller boat departed at 9.50 am and in about 10 minutes we were transferred to the Ferry Malaysia Express for a super smooth 1 hour and 45 minutes ride to Dumai. Dumai is much warmer than Malacca. Its oil refinery and tankers can be seen almost along Dumai's coastline. The region is rich with oil and yet to be discovered. This would explain the sticky and greasy feeling on our skin. Upon the arrival, we manage to peacefully go through Indonesian gate without any disturbance or charge from the porters. It's another 10 minutes walk to the 'Bis Pariwisata'. Waiting are a driver and a co-driver, both named Zul and are locals of Bukittinggi. Stuffed our backpacks in the compartment and drove to a nearby Rumah Makan Pak Datuk (restaurant) to endeavour Minang food. It was delicious at about Rp336,000 for 20 hungry people or RM7 pp, very cheap, eh? However, some complained that lauk is too hot. It was 8 pm at Rumah Makan Musafir and there was no electricity, and we were quite starving. The group has to decide whether to move on to the next restaurant (another 2 hour drive) or to wait until the diesel generator working again. We waited for about half an hour because we are stopping over to pray anyways. Then the lights are on and we had our Minang dinner at about 9 pm. Arrived at Bukit Tinggi at about 12:30am. The half awake crowd transferred the backpacks to Ibu Halimah's family house. 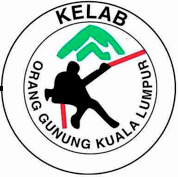 It is located at Bulaan Kamba Kubang Putih. The house was an ordinary kampong type house with three bedrooms, medium sized hall, a kithen, and a bathroom/toilet. The 16 guys slept in the hall while the girls get one of the bedrooms. It was quite chilly night, but we were given enough blankets and pillows. Thanks to Ibu Halimah's family. We slept at about 2 am. Everyone was awake at about 6:30 am. The girls cooked nasi lemak for breakfast. We ate happily with Ibu halimah's family and at 7:30 am, we all packed and start the journey to Kg Dusun Tua. The kampong located at the foot of Mount Singgalang, at about a fifth of its height. We observed that most houses and even mosques here have a medium sized pond adjacent to the building. It is perhaps a fishpond for the household, although some women seen to have their laundry done at the pond. The road towards Kg Dusun Tua was very narrow and winding, but Zul, the bus driver skilfully twist and turn the vehicle as the route allows. We arrived at the highest residential peak safely. Kak Zaleha donates some books to the pupils of Sekolah Dasar (Primary School) Kg Kota Tua. The view from up there is magnificent and perhaps the school has the best view of Mount Marapi. Regardless of the school and village being underdeveloped (compared to its city counterpart and of course in Malaysia), we noticed that school children are happy as we received a very warm welcome from the villagers and school staff. Cikgu Yufrizal (the school headmaster) explained that the school's development was left behind after President Suharto left his throne. However, it is very sad to see the bright and cheerful kids had to gain knowledge at the tired building where the teachers are mostly volunteered to service. We left our backpack at the school lounge and head down to Koto Baru, where we stayed at Cikgu Yufrizal's house for the noon, and performed Friday prayers at the nearby mosque. Even during the hot day, the tap water is cold. Then we had our lunch at a nice Minang eatery. Despite the nicer food, the price is cheaper in the rural area. At about 4:30 pm, we started stretching instructed by Kak Zaleha and bid farewell to Cikgu Yufrizal's wife. A very happy and friendly bunch. We trekked up to Kg. Dusun Tua. Reached the primary school at 5 pm and we collected our backpacks before started our journey towards Mt. Singgalang. Two guides headed the line while Cikgu Yufrizal followed the group. It was getting dark and were told that it would take four to six hours to reach the mountain's peak and that has without a doubt uplift our spirit to reach the peak quicker. And the journey goes on until dark and through rain. We are divided to four groups. The trekking was both very challenging and tiring. Our visibility is very limited because we had to climb in darkness. However, all along the route, the full moon is visible at north, giving the illusion that we are getting closer to the clearings ahead. That probably had given us some extra push while fighting with cold and hunger because we had skipped dinner that night. With backpacks taller than ourselves, these conditions did not allow us to march as quickly as we would imagine. As a result, at about half way up to the summit, we had to take five almost every 15 minutes, as to either purely resting or to eat some light snacks and drink. There was no campsite found along the trek except for the final half and hour. As we climbed closer to the peak, we noticed something which is much different with Mt. Singgalang compared to the other mountains. Firstly, there were huge trees with big trunks covering the rim of its non-active volcanic crater. And secondly, there's only a small field of 'bonsai' trees were found along the track, and that was the first camping site we came across. In any case, we could see an astonishing view of the town and experience smooth refreshing breeze from the latter. The first group arrived at Telaga Dewi at 12:30 am while the sweeper group at 4am. We opened the tents there and cooked supper. The temperature was chilly but bearable due to food intake and campfire. We caught some zzzs until 6:30 am. Early in the morning, we climbed up to the summit of Mt. Singgalang. It's about 15 minutes walk from Telaga Dewi. We noticed that the track was much different in the daylight (of course). All along the way, we can see mosses living on the moist surface of another bigger plant. This type of natural habitat is unique to Singgalang as it is rich with water. The all-year damp and wet surrounding promotes the growth of these thick masses and covers every area even on the wood of a living tree. Even the ground was spongy. When reaching the peak, the first thing that we could recognise was the view of Mt. Marapi, with its smoke coming out from the crater. And the clear sky with a lot of houses, ponds and streets underneath. So, the area instantly became a studio for taking pictures. The painstaking climb which we had experienced the night before was gone with the cool breeze. We notice that there was an RCTI aerial structure located at the peak with cables that goes down towards the foot of the mountain. The cables would easily be at least 4 km long!! At 8:30 am, all of us had our breakfast (noodles, cucur and coffee), packed and ready to roll. We descended along the RCTI aerial cables, through a challenging track of dense jungles, bamboos, and vegetable plantations. Mt. Singgalang track ends up at RCTI building where we can walk through a concrete road towards the bus. Along the road we could see acres of chilli, sugar cane, and cabbage plantations. There are also sugar factory. We noticed the all farming work are done by the Sumatran's hand without much use of machineries. The bus took us to Ibu Halimah's house where we unpacked and repacked the backpack, only to carry drinks and ration stuff for Mt. Marapi journey. We ate dinner at a Minang Restaurant and start trekking to Mt Marapi from Koto Baru, the base of the mountain. We left the bus at the side of a road and walk about one and a half hour towards the registration booth. The mountain is a more popular climb compared to Singgalang whereby the track and its camping sites has been controlled and supervised by the locals. The mountain ranger gave a few handy tips and warned us to be on the peak for a maximum time of half an hour. This is due to the last 'unexpected' accident whereby eruption occurs two years ago. After registration, we walked up along a single lane path. It's a two hour ascending walk towards Pasanggrahan, a spot for rest and relax (or maybe overnight). There we met a group of student climbers from Medan. They are very friendly and easy to talk to. We had some coffee and snacks to get energised and to overcome the chilly night. At 11 pm, we start our journey up toward the peak of Mt. Marapi. We went through hundreds of camping ground especially at the foot of the mountain. All of them were occupied for this weekend but camping in Mt. Marapi was in the schedule. We manage to reach on a levelled area of the crater at 7:30 am. The place was full of dark grey molten larva rocks. The view from up there was so breathtaking, though there was always a stint smell of sulphur around the volcanic chasm. Mt. Singgalang was standing high on the west and some say we can almost see Padang (West Sumatra). We took pictures and went up towards the very steep mouth of Marapi. It is as long as 1 km in diameter. So, we walked as far as half kilometre towards the south of the mountain, where Merpati peak is located. For a beginner, the step up was really scary as the ground was made up of loose rubble and hardened sulphur. There was few teenagers offering what they called 'bunga abadi' or the ever blossom flower (adelweiss). It was taken from a garden located at the south of the mountain. After taking many pictures, we descended down towards Pasanggrahan. Besides raining a little bit and caused a slippery track half along the way, some of us has foot injury and had to slow down a little, although the local kids just running fast without a shoe. The camping site we seen occupied last night was all vacant today and all is left was heaps of garbage that was not a real eye candy. At about a kilometre (45 minutes) away from Pasanggrahan, we noticed there were two men, both carrying a sack of traditional herbs and roots collected from Marapi's foothill. Close by was a very practical stall selling instant noodles, fruits, kuih-kuih, and cold and hot drinks. We reached Pasanggrahan to shelter ourselves from the rain and head down towards the bus. At 3 pm, we reached Ibu Halimah's house, packed and bid farewell to the beautiful family and later checked in to a hotel in Bukittinggi and had dinner and a night rest. After breakfast, we head up towards Padang. It's a six hour drive to the beach where we had lunch at a beachside café. Close to the café was some fisherman just landed from a fishing trip. Padang was a small capital with lots of Minangkabau buildings, horn-shaped roofs. The west Sumatra capital is famous for its silver, hand weave, embroidery and woodcarving souvenirs. All are available for tourists. The people here are friendly and very generous with smiles and nice words. Later during the day, we head back towards Bukittinggi for a shopping spree. In the middle of the town was a clock tower with Minangkabau roof named Jam Gadang. It overlooks the market square and the town's historical surroundings. Besides Jam Gadang were locals sitting down chilling. There are some small kids asking for money. Similar souvenirs were available for tourists. We started our journey to Dumai at 8:30 pm. We arrived at Dumai just after Subuh. Packed and clean our selves up before breakfast at a nearby restaurant. There Deeno gave a speech and everyone congratulate each other on our adventure. All of us sang Negaraku as apparent to our National Day. Head east to the jetty where we bid our sallam and thanks to the Zuls and later through immigration. We safely reached Malacca at 2 pm and towards KL at 3 pm.